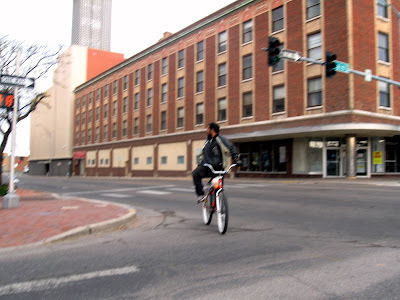 As I waited at the stoplight on 4th and Main this morning, I watched this guy swerve in and out of traffic while he attempted to look behind him. I think he was looking for cars and he came real close to finding one closer than I'm sure he wanted. He almost got hit 3 or 4 times while trying to look backwards and ride forwards. Surprisingly, it's not that easy to keep both hands on the handlebars, turn your head and shoulders nearly 180 degrees, focus on something behind you, and continue to ride straight. That's the correct bicycle "safety" way, but it's HARD and naturally makes you want to swerve. It takes a bit of practice. I personally feel more comfortable keeping only my right hand on the bars, letting go with the left hand while turning my head, shoulder and torso to look whose behind me. Probably the safest thing to do is get a decent mirror.